Description: Bushy, twining, woody stemmed vine with pinnate, evergreen variegated foliage, having between five and seven lance-shaped leaflets up to 50mm long. 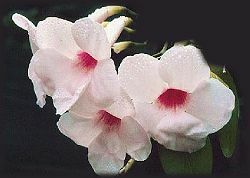 Makes fragrant funnel-shaped white to pink flowers with deep pink to maroon throats in Spring and Summer, followed by large elliptical fruits containing many seeds. Moderate rate of growth. Evergreen in frost-free areas; perennial if roots are protected during heavy freezes, when it will die back to the ground. Conditions: Prefers rich, moist, reasonably well drained soils but will grow almost anywhere; prefers full hot sun but tolerates partial shade. When established will tolerate extended dry spells. Grows to 5 metres on fences and trellises. Cut back after flowering to retain shape. Propagation can be carried out easily from either seed or cuttings. Variations 'Alba' and 'Lady Di' are white, 'rosea' 'Charisma' and 'Southern Belle' are pink with darker throat. Originally found in the hills above Rio de Janeiro, but apparently no longer found in its native habitat. Does well in tubs and hanging baskets. Requires sunny position, tolerates partial shade. Not frost tolerant. Needs well drained mulch or potting mix, with slow release fertiliser application in Spring and late Summer. Keep moist but do not allow to stand in water. In warmer parts of Australia will flower abundantly from September till June or later. In cooler climates it flowers from November to March. Propagate from hardwood cuttings. Sprinkle single node cuttings with rooting hormone and growth should commence in a month or so.